If you would like to request a paper copy of any of our policies, please contact the school office. Who are the best people to talk to about my child's Special Education Needs or Disabilities? What support is available for children with SEND in our school? How can I let the school know that I am concerned about my child's progress? How will the school let me know if there are concerns about my child's progress? How is additional support allocated to children? What agencies can provide support for children with SEND in our school? How are the teachers supported in working with children with SEND and what training do they receive? How can you support me as a parent / carer of a child with SEND? How is St James accessible to children with SEND? How will my child be supported when he or she is moving classes / to another school? 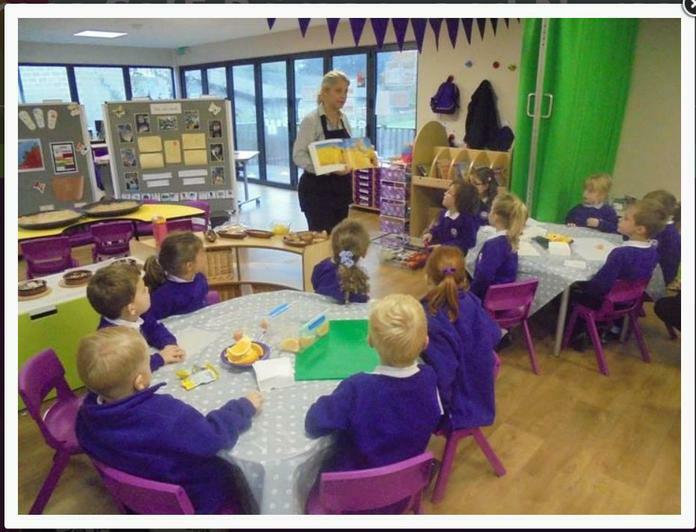 To celebrate World Food Day, we had a visit from Waitrose in Okehampton who shared the story of "Handa's Surprise" with Butterflies Class. The children were able to taste all of the fruits which appear in the story from around the world. Many thanks to the Waitrose Team for this fantastic opportunity! Welcome to St James Church of England Primary & Nursery School. We opened in September 2018 and welcome enquiries and visits. Please contact the school to find out more. Looking for a Nursery place? We are now inviting applications! Please see our Nursery page (under key information) for more details!